I really like this post, Julian has explained the level of change resistant, and I think that most of what he say it can be applied to the teacher resistant to change their old skills and learn some digital skill to face the educational paradigm. I invited you to read the article and comment about it. I’ve been exploring the 16 Resistors of change in more details as we look at how to segment and overcome the inertia. Today i’m looking at four aspects of resistance that sit under the heading of ‘Behaviour’. 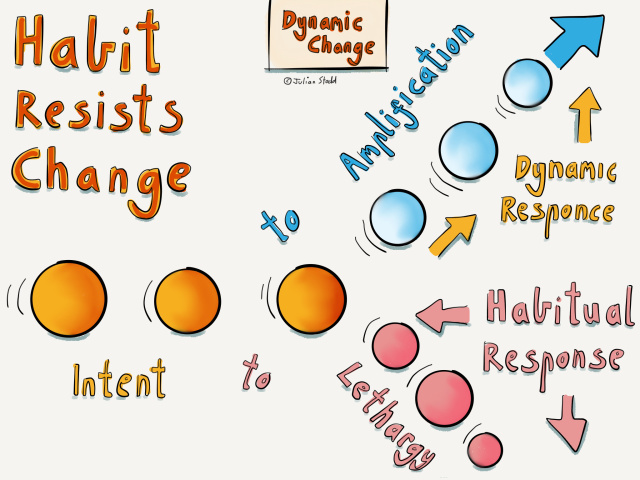 These are ‘habit’, habitual responses triggered by familiar situations, ‘elasticity’, which is about understanding where the flex is within an organisation and where the rigidity sits, ‘reward’, which is about understanding the reward and reputation environment, and finally ‘performance’, which is where we discover where the rehearsal spaces sit. This is part of the wide body of work i’m pulling together into the new book, which will be about Organisational Change in the Social Age.